All parents want their child to develop to the best of their abilities. And in pursuit of this goal, many parents (and grandparents) buy lots of devices in the belief that they will foster faster or better development. But the truth is, most of these devices not only are unhelpful, they may be hindering your infant’s development. Which devices are harmful for your baby, and which are helpful? Pediatric physical therapists often caution parents about overuse of devices. They feel the basic activities and toys are best. One of the best ways to help promote your infant’s development is to put her in the prone position (on her belly). This is commonly referred to as “tummy time,” and is directly correlated to the development of the core muscles. Thankfully, infant walker use is declining, partly due to education of parents about their dangers and the use of other devices, such as exersaucers or bouncy chairs. Why Are These Devices Not Helpful? These containers include strollers, car seats, bumbo seats, bouncy swings, exersaucers, bouncy chairs, vibrating chairs, rockers, and nursing cushions. These items are useful and sometimes necessary for the infant’s safety, but overuse of these devices can lead to container baby syndrome. In particular, moving the infant from one device to the next without any time to play and stretch is often what leads to this syndrome. 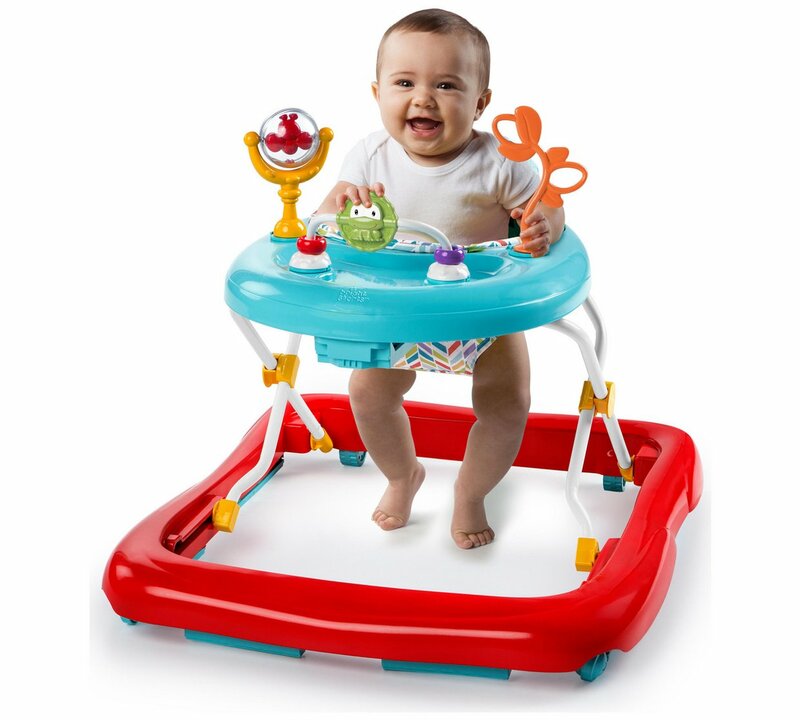 Using devices such as exersaucers and walkers allows for increased limb activity, but does not allow for development of core muscles, which are needed for sitting, standing, walking, and running. This situation “disrupts the typical developmental pattern,” according to Laurey Brown, doctor of physical therapy and pediatric clinical specialist at Lurie Children’s Hospital in Chicago. Dr. Brown notes that much of the equipment consists of “inherently passive devices,” such as the bumbo seat, sling seat, and swings. These do not allow the child to actively use her body. For example, the bumbo seat promotes poor posture. The child sits in the bumbo seat with the lumbar area (lower back) flexed and the head forward, which discourages use of the spinal muscles. Dr. Brown notes that if you look at toddlers who used the bumbo seat a lot as infants, they still sit with the same poor posture. Like all physical therapists, Dr. Brown understands the need for parents to put their children in a safe place while they are otherwise occupied, so she suggests using a pack-and-play or old-fashioned playpen. This permits the infant to explore, crawl, pull to stand, and be safe. When the infant can climb out of the pack-and-play, then it is not safe to use anymore. What Devices Are Good For My Baby? Tummy time on a hard surface: Ms. Brown sees a lot of infants whose parents put them on a soft surface, like a bed, for tummy time. That doesn’t help them as much as a hard surface. Don’t be afraid to just put them on a thin blanket on the floor or on a firm carpet. To help, try getting a firm puzzle (shapes or letters that connect together on the floor) on the floor. Don’t use a mat with a roll on it: this, too, will put the infant in an unnatural position. The pack-and-play: as discussed above. Toys with mirrors: babies are often fascinated with mirrors, and they will look at them for a long time. O balls: this rubbery, bouncy balls with a rattle are easy to grab, and will help your child develop both fine motor and gross motor skills. 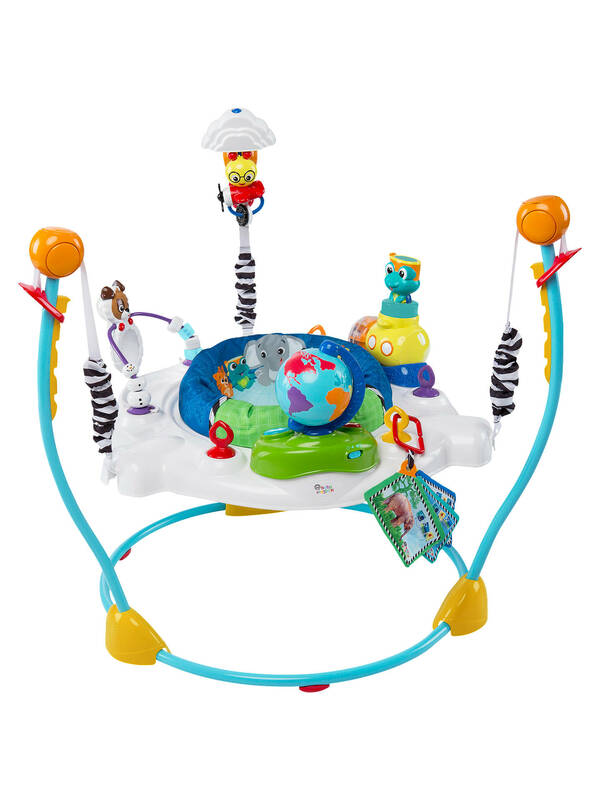 RIng stacker, shape sorter, pop-up toys: these illustrate cause and effect, can keep a baby busy for awhile, and also promote fine motor skills. Standing tables: these often have activity centers on top of the small table. An infant can work on pulling to stand or cruising around the table, and the activity center helps with fine motor skill development. Push toys: these are items, often with a long handle, that the child can hold on to while pushing. This promotes walking and overall coordination. Tiny play grocery carts or lawn mowers are common, as is the “popper,” which makes noise when the child pushes it. A small play kitchen: this builds on the idea of the standing table, as the child can pull to stand and cruise around the kitchen. If it has plastic food items, it will also foster the progress of fine motor skills. Pin T, Eldridge B, Galea MP. A review of the effects of sleep position, play position, and equipment use on motor development in infants. Dev Med Child Neurol. 2007 Nov;49(11):858-67. Abbott AL, Bartlett DJ. Infant motor development and equipment use in the home. Child Care Health Dev. 2001 May;27(3):295-306. Sims A, et al. Infant waker-related injuries in the United States. Pediatrics. 2018 Oct;142(4). Avruskin A. Physical therapist’s guide to container baby syndrome. American Physical Therapy Association. Physical Therapist’s Guide to Container Baby Syndrome. Acute Flaccid Myelitis: Do I Need to Worry?